View the printable list of what to bring and what not to bring to HHW events. 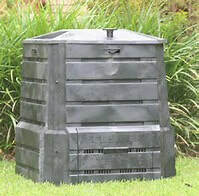 These are Thursday nights; workshops begin at 6:30 p.m. Attendees may purchase a SoilSaver composter for the greatly-discounted price of $30.00 (additional units are $50 each). Please bring a check or cash as we cannot process credit cards. The workshop presentation is about 45 minutes in length with plenty of time afterwards for questions and answers. Cat Buxton will teach the workshops. To sign up, call 674-9235 or email mobrien@swcrpc.org. What happens to the glass you bring to the transfer station? Well, if you go to the Cavendish, Ludlow, Rockingham, or Springfield transfer stations, all of the pickle jars, peanut butter jars, Snapple bottles, and wine bottles end up in a big pile on Springfield town land. Once a year or so, the glass is ground up. That glass is called processed glass aggregate or PGA. Contractors can use PGA as a gravel substitute in a variety of applications. If you have a no-longer-used but working sewing machine, please consider donating it to the Sewing Peace project. Just bring it to your local transfer station (Ludlow, Rockingham, or Springfield) and let the folks there know that you want to donate it to Sewing Peace. Thank you. The May shipment arrived in Uganda on July 24, 2017. It was a long voyage but the boxes of sewing machines arrived safely. Thank you. (In 2016 we sent 43 machines; in 2017 we sent 95 sewing machines, including 3 treadles!) In 2016, Dan Farrar, transfer station operator at the Springfield Transfer Station, accepted unwanted, working sewing machines for "Sewing Peace," an initiative of Pedals for Progress. The year's total was 43 machines, some of which were shipped to Albania, some to the She Can Foundation in Tanzania, and all of the portables that were in their original plastic cases went to Ghana.Read more about the Foundation on the Pedals for Progress website. The Springfield Transfer Station serves as a collection site for working but unwanted sewing machines. Once a year, the machines are trucked to South Burlington to join a shipment sent overseas by the non-profit, Pedals for Progress (P4P). P4P started collecting bicycles years ago, and later added sewing machines. In 2015, the Transfer Station collected 25 sewing machines which made the long trip to Fiji. This photo from January 2016 captures the happiness of one recipient. "The poorest individuals in developing countries need work. Finding work, much less a career, in developing countries can require a Herculean effort. The barriers are often impossibly high and include widespread unemployment, limited education, inability to acquire credit, and discrimination. On top of this, many developing countries simply lack the industries, infrastructure, and robust economies that can keep people working." "A portable sewing machines, used, but in working condition is a job, period. In 2000, P4P sent its first sewing machine and discovered that these machines are in demand in the same places where our bicycles have changed so many lives for the better. Plenty of unwanted portable sewing machines exist in people's homes. They're often headed for a landfill or languishing in a closet." "Overseas, seamstresses and tailors alike can acquire their most valuable tool and begin a business. Students can learn to sew - many of these machines will outfit programs in schools, teaching people a valuable skill they can use anywhere." "How can we export good used sewing machines overseas? Pedals for Progress is a non-profit charity seeking useful used items destined for U.S. landfills, donating them overseas where they can become productive assets for the poor. P4P has maintained active bicycle recycling programs in foreign countries for 22 years. P4P's bicycle programs are so well established that the distribution channels for used sewing machines already exist with our overseas partners." "The sewing machines go to non-profit vocational education, small business, community service programs and individuals." "In the developing world, a portable sewing machine is a vital workaday tool. Brand new, these are priced well out of reach of the working poor. Which is why your help is so critical. By including these machines with our bike shipments, we've managed to significantly defray their shipping cost." "Other non-bike locations have higher shipping costs as we need to airfreight the machines, larger cash donations help us provide someone with a most valuable asset - the means to ear a decent living in more remote locations." "In a shipment of used bicycles to the Rotary Club of Monte Cristi in the Dominican Republic, we included the first 17 machines - and a new P4P sponsored initiative was born. 12 years later, 2,300+ sewing machines have been shipped! Sewing machines provide a direct means of financial independence for the men and women struggling to support their families in these emerging economies. Let these people help themselves by supplying them with a tool with which to work. That old sewing machine gathering dust!" What is leaf and yard debris? It's all of the following, and as of July 1, 2016, it is banned from the landfill. As of that date, haulers who offer trash collection must also offer a service to collect leaf and yard debris, separate from other waste. They may charge for this service. Residents may also bring this material to their transfer station where they may be charged a tipping fee. Clean wood or "wood waste" is also banned from the landfill as of July 1, 2016. What is "clean wood?" It includes trees, untreated and unpainted wood including dimensional lumber, and other natural woody debris, including tree stumps, brush and limbs 1" or greater in diameter, root mats, and logs. Neither haulers nor transfer stations are required to collect clean wood. However, transfer stations may offer a spot for dropping off clean wood for other residents to pick up for reuse. **DO NOT bring used oil, batteries, asbestos, radioactive material, empty containers, fireworks, tires, medical waste, dry creosote, or ammunition. Fluorescent tubes and compact fluorescent bulbs go to your transfer station or local participating hardware store. Please note: Keep products in their original containers. Do not mix products. Never smoke near hazardous materials. Do not leave your vehicle when you arrive on site; you will be assisted by trained staff. The District has the right to refuse any material based upon its nature. Please call 674-9235 or e-mail mobrien@swcrpc.org with questions. Thanks to the efforts of wine drinkers throughout the District, we have recycled over 25,000 corks. We ship natural corks to reCork which uses them to make cork soles for shoes. The shipping is free so there is no cost to the District and it's one more resource that's not going to the landfill. All District transfer stations collect corks. Battery Recycling Update: Save Our Landfill! Have you been throwing the used batteries from your remote controls, flashlights or toys into the trash? Stop! Until recently that was acceptable in Vermont. However, since Jan. 1, 2016, the State has added single-use batteries (AA, AAA, C, D, 9v, hearing aid, coin cell, tool, and button) to the list of accepted recyclables. What does this change mean for you as a resident? You can now recycle most household batteries at your closest transfer station. This includes rechargeable batteries which have been accepted since the mid-1990s. Expanding battery recycling to include single-use batteries is a direct result of a product stewardship law the Vermont legislature passed in May 2014. The law (H. 695) makes Vermont the first US state to require single-use battery manufacturers that sell batteries in the state to pay for their collection and recycling. Manufacturers have voluntarily recycled rechargeable batteries since 1994. Under the program, battery recycling is free of charge for residents. Residents who visit the Springfield station will see a custom-built battery shed with separate compartments for different battery types. Dan Farrar, Transfer Station Manager, built the shed several years ago when local residents became frustrated by the lack of recycling for single-use batteries. “Intuitively people don’t feel good about throwing away batteries. They know there is value and materials should be reused,” said Mary O’Brien, recycling coordinator for the District. In addition to transfer stations, Vermont residents can drop off their batteries at a Call2Recycle collection site; 96% of Vermonters have a site within 10 miles of their homes. Call2Recycle, Inc., North America’s largest consumer battery stewardship organization, is overseeing the state-wide program on behalf of manufacturers. Call2Recycle uses a network of recyclers who extract usable chemicals and metals for use in manufacturing new batteries, stainless steel and cement additives. You can find out more about what batteries are accepted and how they are recycled by clicking here. Vermont has solid waste legislation that focuses on recyclables and organics. Act 148 Universal Recycling will lead to more consistent services throughout the state. To read more about this law, click here. If you would like to look at and/or use the new universal recycling symbols for recycling, food, and trash, click here. Download the Universal Recycling timeline and/or a summary of the new law.